I love long weekends, even though as a self-employed person, those kind of designations don’t really mean that much. Sometimes I feel a bit like the Countess Dowager from Downton Abbey asking “What is a week-end?”. Except, in my case, it’s because I’m usually working everyday. Weekends and long weekends, let alone designations of “regular business hours” can get lost in the hustle. But last weekend I made sure I marked the occasion by hanging out with friends. Saturday we played board games and mixed strong cocktails with our favorite couple. On Monday, I had a friend over for lunch (you’ll hear more about our meal in another post). And in between, on Sunday, I made this slaw for a good group of friends who brought over sandwich fixin’s for a little potluck lunch. I loved this salad, though it has several components that make it not quite a snap to pull together at the last minute. First there are some red onions and garlic that need to caramelize and crisp up. Get those done an hour or so ahead of time. Then there’s some almond slices that need toasting as well as some tofu that needs marinating (though I let sit for 5 minutes in a quick marinade & it turned out perfectly) and baking. And because this is a slaw, get your cabbage sliced nice and fine. But regardless of the footwork…or is it handwork…that needs to be done, it’s worth it. And I forgot to mention the best part – the miso vinaigrette. It’s tangy and sweet and it’s the one component that is a cinch to mix up so you can easily transpose this dressing to whatever salad you’re making with ease. The combination of every ingredient is magic: from the caramelized onions to the miso. 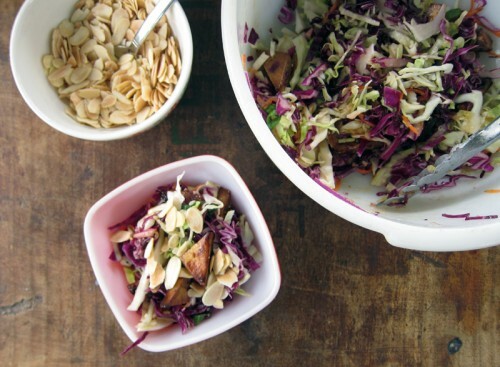 It’s an elegant take on a plain old cabbage salad. So make this salad for a group of your best friends and celebrate long weekends, long days and good times. elsewhere: This week I made some fantastic roasted cauliflower with lemon and Parmesan over at Poppytalk. I’m still craving it, so do yourself a favour and bake up a batch! * For the tofu marinade, I just mixed a little soy sauce, sriracha, french minced ginger, sesame oil and a splash of rice vinegar. I let the tofu sit for 5 minutes and then baked it on a cookie sheet for 10 minutes, flipped each triangle and baked for another 5 minutes. Easy! If you are making this gluten-free, skip the soy sauce and use a g/f tamari. 1. Start by caramelizing the onions and garlic in the olive oil over med-high heat. When they’re brown, stir them around occasionally and try to let them get a little crispy. Let them dry on a paper towel. 2. 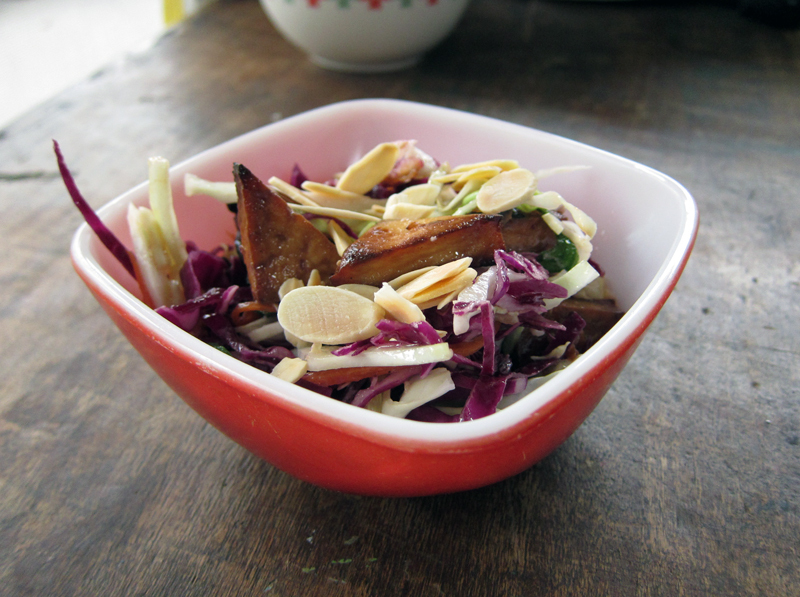 Place the sliced cabbage, julienned carrots, caramelized onions and green onions in a large serving bowl. Top with the baked tofu. 3. Mix together the dressing ingredients in a small jar. Shake or whisk until it comes together. Pour over dressing and toss. Scatter with the sliced toasted almonds. Serves 8. I think what I like most about this is the color of the dish. This is a really yummy sounding and gorgeous looking dish! Do you think it would still hold up without the red onion or would it need another flavor component? Redd, I loved the deep flavour from the caramelized onion, but if you want to skip it, I think it will still be a lovely slaw….just not the same. Let me know if you try it! Yes! 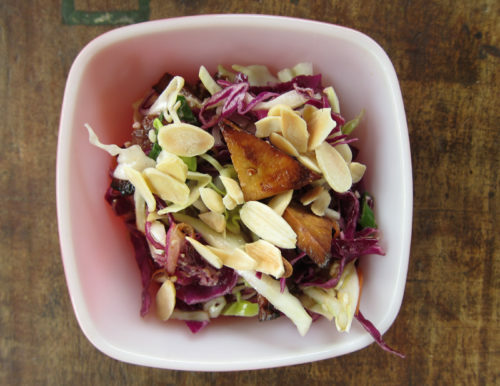 Slaw variations rule and looks like this one is no exception. I’ve been eating slaw a lot lately but just with olive oil, balsamic vinegar and some hot sauce. Your version sounds delicious with nuts and caramelized onions and garlic. And that dressing, wow! Yeah!!! I have all the ingredients in the fridge… I love it when that happens! I’m thinking this makes a nice, healthy, easy dinner tomorrow. Thanks, Louisa, this is a great version! Joanne, this is a good way to mix things up – I love the dressing so much here! And the caramelized onions and garlic really add a depth of flavour. So good. I hope you try it out, Piper, it’s a good one. Nata, so glad you loved this slaw and that it made you look good 🙂 Hooray!! I love miso paste!As I am from Japan I make miso soup and other standard dishes using miso all the time, but I am always looking for recipes with miso paste with some twiste. Thanks for the recipe and it looks so yummy and pretty! Your photos are so pretty!! This sounds incredible, too. Ha, the Dowager Countess is my favorite! This looks like a perfect spring/summer salad – crisp and light! I love all of the different textures with the carmalized onions and garlic, sliced vegetables, toasted almonds and tofu. Simply wonderful! Combination of flavors sounds awesome! I’ll have to try this asap — just need to pick up some cabbage! Can, I hope you enjoy this twist on using miso! Enjoy. Thanks NicoleD – I’m blaming my new photos on the great light we’re getting in our new place. Allison, yes, it is the perfect summer salad! All the flavours and textures really work great here. 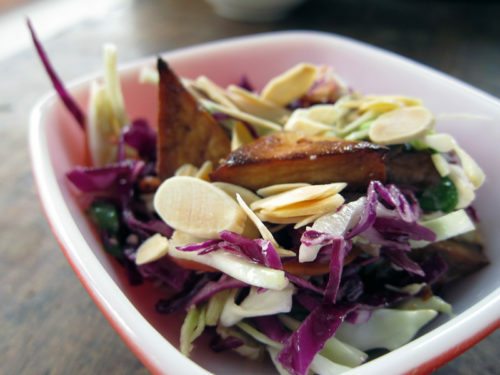 I love this kind of salad AND that is is more hearty with the tofu than just a plain old slaw. LOVE it. Hello, miso! I made this and it was OK, but there was too much of a cabbage intensity for my taste. Also, the instructions do not explain what to do with the caramelized onions and garlic. Robert, I never noticed a particularly strong cabbage flavour – maybe it was an older cabbage or a strong head! I corrected the recipe – they just get scattered in with the rest of the ingredients and tossed. I really liked how all the flavours combined. Frewmanchu, I baked the tofu at *I think* 400F and baked it for 10 minutes, flipped and then another 5. Next time, I’d try a total of 10 minutes or turn down the heat. Glad you enjoyed the slaw! I just made this and it was the hit of the party! Eviedee, I can guarantee that this is definitely mouthwatering. Enjoy! Nata, so glad you enjoyed this!